Pierantonio Mezzastris came from a family of artists: he was the nephew of Paolo Nocchi, and thus the great nephew of the painter Vagnozzoro (Noccuro) Meccastra (died after 1388). His young sister, Onofria married Bartolomeo di Tommaso in ca. 1442, and his son Bernardino Mezzastris, also became an artist. He was first documented in his father’s will in 1457 and last documented in 1500 in the will of his wife, Sibilia. he seems to have died in ca. 1506. This detached fresco, which is signed by Pierantonio Mezzastris and dated, came from the church of the Ospedale Vecchio di San Giovanni Battista. This detached fresco, which is attributed to Pierantonio Mezzastris, came from the church of the Ospedale Vecchio di San Giovanni Battista. 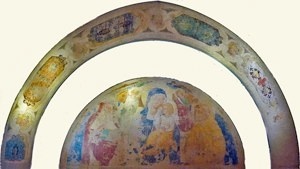 This fresco, which is signed by Pierantonio Mezzastris and dated by inscription, was detached from an aedicule above the entrance to the convent of San Francesco in ca. 1860. It depicts the Madonna and Child with SS John the Baptist and Francis. A black and white photograph was subsequently inserted into the aedicule. This detached fresco, which is attributed to Pierantonio Mezzastris, came from Chapter Room of San Francesco. St Simon offers two doves to the Child, in a scene from the Presentation at the Temple. ✴SS Blaise, Jerome as a penitent, Bonaventure and Sebastian on the left. This detached fresco, which is attributed to Pierantonio Mezzastris, came from San Domenico. It depicts the Madonna and Child with SS John the Baptist and Dominic and musical angels. This damaged detached fresco, which is attributed to Pierantonio Mezzastris, came from the chapel to the right of the presbytery in San Domenico. It depicts the Crucifixion with the Virgin and SS John the Evangelist, Peter, Paul and the kneeling Mary Magdalene. 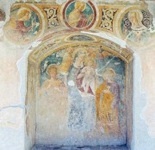 The sinopie survives in the original location; the figures of St Mary Magdalene and of the four angels in the fresco do not appear in the sinopie, which suggests that they were later additions. This damaged detached fresco of the head of an angel in a tondo came from the chapel to the right of the presbytery in San Domenico. It was probably on the side of an entrance arch, opposite another of the Virgin Annunciate, and seems to have been part of a composition that included the Crucifixion above. The fresco is attributed to Pierantonio Mezzastris or Benozzo Gozzoli: it is almost certainly based on the cartoon that was used for Benozzo’s fresco in Narni. It has to be said, however, that there is no documentary evidence that Benozzo was ever in Foligno. This sinopie of a fresco is in the tabernacle (1480) to the right of the external facade of the church. It was part of an external chapel that was used during epidemics: St Anne was revered in Foligno as a protector in times of plague. This fresco under the 3rd arch on the left depicts the standing saint in front of a cloth of honour held by two angels and pointing to a scar from the plague on his thigh. This fresco in the 3rd bay on the right wall depicts the Crucifixion with the Vurgin, St John the Evangelist and two angels. The donor kneels at the foot of the cross. The fragment of a figure of a female saint to the right of this fresco is also attributed to Pierantonio Mezzastris. This fresco under the pilaster to the right presbytery depicts the standing saint, who is dressed as a cardinal, is crowned by two angels. This damaged fresco is on the counter-facade, to the right of the entrance. ✴the Crucifixion with the Virgin and SS John the Evangelist and Mary Magdalene on the right wall. 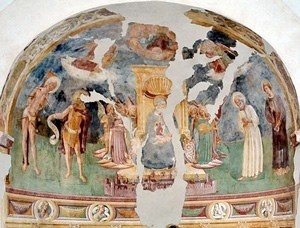 This fresco in the apse of the church of the Madonna della Fiamenga (see the detour from Ponte San Giacomo in Walk I) is signed by Pierantonio Mezzastris and dated by inscription. It depicts the Madonna and Child enthroned, surrounded by musical angels, with the blessing Christ above. Four saints stand to the sides: SS Sebastian and John the Baptist to the left; and SS Jerome and Leonard to the right. There is an interesting cityscape of Foligno below the throne, and busts of sibyls in tondi in the frieze below that. ✴the figures of the Annunciation flank Christ blessing in the tondi above. This fresco in the lunette above the entrance to the nunnery of Santa Lucia is signed by Pierantonio Mezzastris and dated by inscription. It is the earliest known work that can be securely attributed to him. It was commissioned at the time that the nuns were granted the privilege of poverty, following which they sold most of their assets and spent much of the proceeds on rebuilding their church and adding a new wing to the adjacent nunnery. It was originally under a roof supported by four columns at the entrance to the newly completed wing of the nunnery, and was placed in its present location during the rebuilding of the nunnery in 1928. This processional banner, which now forms the altarpiece on the first altar on the left of San Giacomo, was probably painted for the original Cappella di San Rocco (1480-5) in the church. It seems to have been used for the first time in 1481, when an annual procession was instituted in the city. The banner, which is attributed to Pierantonio Mezzastris, depicts St Roch commending the people of Foligno to the Risen Christ. This fresco, which is attributed to Pierantonio Mezzastris, is above the entrance to the nunnery of Sant’ Anna. It was financed from the will (1481) of Elena, the widow of Filippo di Ser Andrea Varini. It depicts the Madonna and Child enthroned with St Anne and the Blessed Angelina, below a cornice with angels throwing flower petals. Unfortunately, the lower part has been lost. This fresco in the courtyard of the nunnery of Sant’ Anna, which is attributed to Pierantonio Mezzastris, is dated by an inscription on the campanile of the chapel. This fresco was recorded in an aedicule above the entrance to the nunnery of SS Trinita in Annunziata in 1866, with an attribution to Pierantonio Mezzastris. It was subsequently detached and lost. Two other frescoes on the counter-facade that featured in in the work commissioned from Pierantonio Mezzastris are generally attributed to Andrea d' Assisi, l' Ingegno or (more recently - see the reference below) to Perugino. This fresco in the choir behind the apse of San Damiano is attributed to Pierantonio Mezzastris and dated by inscription. This detached fresco, which is attributed to Pierantonio Mezzastris, was detached in 1925 from a room in the novitiate of the convent of Santa Maria degli Angeli and is now in the Museo della Portiuncula. This fresco fragment in San Vincenzo, which was probably destroyed in 1986, was attributed to the young Pierantonio Mezzastris. A surviving black and white photograph depicts the crucified Christ with angels,with St John the Evangelist and a bishop saint (presumably St Vincent) to the right. A lady on the left presumably supported a figure of the swooning Virgin that had been lost by the time that the photograph was taken. These fresco fragments came from aedicule on land outside Montefalco that was owned by the Bennati family. They were detached in 1878 and mounted on a single canvas before being moved to the Pinacoteca Civica. ✴The main fresco depicted the Mother and Child enthroned with two pairs of musical angels. The lower part of the fresco, which seems to have included two standing saints, no longer survives. ✴The three figures now mounted below, which came from the archivolt, depict SS Antony Abbot and Bernardino of Siena, with a tondo of the Agnus Dei between them. The work is attributed to Pierantonio Mezzastris, based on its similarity to the signed Maestà Bella in an aedicule near Carpello, outside Foligno (see above). This fragment of a fresco of the Madonna and Child with angel in Sant’ Agostino is attributed to Pierantonio Mezzastris. Cardinal Berardo Eroli probably commissioned the important fresco cycle that covers the walls of what is now the Eroli Chapel, San Francesco. The signature of Pierantonio Mezzastris was identified on the steps in the fresco of the dream of Pope Innocent III in the early 20th century, but it is no longer visible. •St Bernardino brings a woman back to life. This damaged fresco, which came from the lunette of a portal of the church of San Girolamo, is now in the Pinacoteca, together with the decorative frescoed cornice of the composition. The main scene, which depicts the Madonna and Child with SS Francis and Jerome, is attributed to Pierantonio Mezzastris. Cardinal Berardo Eroli, who financed the restoration of San Girolamo in 1465-71, probably commissioned these frescoes, at the same time that he commissioned those in what is now the Eroli Chapel, San Francesco (see above). This detached fresco, which is now in the Cappella Nuova della SS Sacramento, San Giovenale (to the right of the presbytery), is attributed to Pierantonio Mezzastris. Its original location is unknown. It has obviously been cut down at the sides. ✴St Francis receiving the stigmata (on the right, above the arch that leads to the cemetery and the convent). In 1488, the Consiglio dei Priori commissioned a series of frescoes from Pierantonio Mezzastris for the Observant Franciscans’ newly built church of San Martino (more specifically, for the altar wall of the Cappella di San Sebastiano there). This was in accordance with an agreement that the Council reached in the previous year with Natimbene Valentini, who represented the friars. (Natimbene Valentini was a member of the town council and also the leading administrator of the convent of San Martino. He had been among the "boni viri" (good and true men) selected at the behest of Bernardino da Feltre to reform the civic life of Trevi). This work has been largely lost, probably as a result of the re-modelling of the church in the late 16th century. However, this detached fresco in the presbytery may well have formed part of it. This double-sided cornice was documented in 1872 in the hospital in the ex-convent of San Domenico and is now in the Pinacoteca. Each side has an image of Christ in a tondo with two angles below: the Crucified Christ is on one side and the Risen Christ is on the other. The cornice probably belonged to a processional banner, and the fact that the Crucified Christ is depicted with two whips makes it likely that it had belonged to a penitential confraternity. The cornice is attributed to Pierantonio Mezzastris, and may well have been commissioned after the outbreak of plague in Trevi in 1478. Sources in the 18th century document a gilded cornice with an image of the Crucified Christ above a panel of the Assumption of the Virgin on the altar of the now-demolished church of Santa Maria della Piaggia, which belonged to the penitential Confraternita di Santa Maria della Piaggia. This was probably the side of cornice illustrated above, to the left. If this link is correct, it is possible to reconstruct the history of the cornice before 1872. The likelihood is that, when Santa Maria della Piaggia was abandoned, the possessions of the confraternity passed to the Compagnia della Misercordia, who administered the hospice at San Giovanni Decollato. These goods would have been moved again to the new hospital at San Domenico in 1817. At some point in this tortuous history, the main panel of the Assumption of the Virgin (which was probably also double-sided) must have been lost. Return to Art in: Assisi Foligno Montefalco Narni Spello Trevi.